As the Vice President for Alliances for the Great Books Foundation, I’m sometimes asked why we have partnerships. We’re a largely self-supporting organization, why do we need alliances? The answer is simple, and it’s an answer that is deeply embedded in our Shared Inquiry™ DNA—we partner with other organizations because we can do more if we work together. The Foundation, a nonprofit educational organization, has a mission that resonates with many for-profit companies and organizations. We believe, for example, that teachers deserve the best possible support in both professional development and materials, that critical thinking is a basic skill, and that democracy depends on people being able to share their ideas with respect. Over the years, the Foundation has formed many successful partnerships with for-profit educational and trade publishers, virtual schools, and corporations that share and support our vision for education. These partnerships provide a great service. They bring the Foundation crucial financial resources and increase the public’s awareness of our mission, brand, and programs. Most importantly, they help us bring Great Books programs to more students and more teachers from kindergarten through college and to more adult readers in all walks of life. Grants from Ameritech and CME Group, for example, have established Great Books programs in more than forty Midwest schools. The programs have served some 14,000 students, most reading well below grade level. For adult readers, Penguin Books financed the Foundation’s creation of discussion guides for 45 Penguin titles—and promoted the Foundation’s selection of those books by placing a Great Books “Recommended for Discussion” seal on every cover. As a result, more than two million book covers in bookstores across the country have proclaimed the Foundation’s mission and the value of discussing great literature. Our ten-year collaboration with K12.com has introduced the Great Books Read-Aloud program to nearly 100,000 homeschooling families. Another longstanding alliance—with an educational publisher in Korea called Hansol Gyoyook—has brought Shared Inquiry to a million families in Seoul. And numerous national and regional collaborations with public TV and radio stations have publicized the Foundation’s message to millions of viewers and listeners throughout the country—that reading and discussing great literature enriches lives. Corporations respond well to the Great Books message and record of success. Corporations value good works, stability, a national reputation, and the ability to reach specific markets. Now celebrating our 65th year, the Foundation has a long history of success providing programs that improve teaching and learning. Over many years, we’ve established deep and extensive relations with leading educators in hundreds of school districts. Our programs put us in direct contact with 5,000 to 10,000 teachers each year, and we reach many thousands more by print and online advertising, catalogs, online newsletters, and dozens of educational briefings and conferences. We have links to more than 800 book clubs. 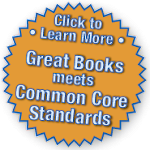 We have a solid reputation as a provider of high-quality educational materials and professional development, and our editorial credentials in selecting and recommending great literature—literature that’s worth talking about—is unmatched. The Foundation values its partners, and we deeply appreciate their support for our mission. They help us publicize our cause, and they help us bring our programs to more people who need them. That’s why, if you know of someone who’s a CEO of a Fortune 500 company, a teller at a bank that has a corporate foundation, or anyone who works at a corporation that wants to give back to the community, send them to the Great Books Foundation. We’d love to share our success and reach more people, with the help of partners who share our goals. Steve Craig is the Vice President for Alliances at the Great Books Foundation. He can be reached at 312-646-7162 or at steve.craig@greatbooks.org.